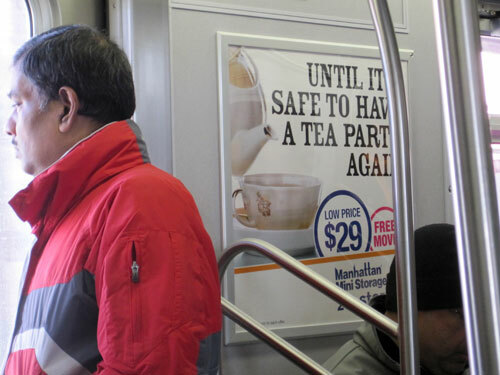 "Until it's safe to have a tea party again"
Like yesterday’s photo, this poster demanded a double take. In a surprisingly political statement, Manhattan Mini Storage winkingly suggests you put your fine china in storage until the phrase “tea party” doesn’t signify right-wing rabble rousers. Hot-button current events and humor are a recipe Manhattan Mini Storage has used in the past to create memorable posters: I remember anti-Bush posters and one featuring Paris and her chihuahua. The design of the poster is basic. Stock photography, a literal logo needing refinement, and a slightly dated, brash color scheme combine to produce a somewhat downmarket feel. Yet the Clarendon-style headline type adds interest and counters that impression. The type hierarchy is not bad. And the concept is great. Manhattan Mini Storage takes a risk that pays off. Because their business is local and their demographic targeted, they don’t try to please everyone with their message. Instead, they present themselves as a company who “gets it.” After all, overflowing one’s small apartment is a specifically urban dilemma—any tea partier can probably store their tea set in the attic.